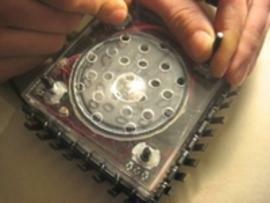 This lesson is designed for artists and musicians interested in creating their own small electronic instruments. No previous electronics experience is necessary. Students are shown how to use simple objects from our modern environment (resistors, capacitors, transistors, LEDs, integrated circuit chips...) to design and build their own personal, customized primitive noise synthesizers. Each is a tiny world of its own, using primitive analog computers in combination with feedback, sensors and audio inputs to create a unique sound. Even from the same plan, no two are alike! Students are encouraged to use found materials for the construction of their personal instrument.